Leave the marine life lenses at home – time to learn what’s needed for a pool photo session. Shooting models in a pool is quite a bit different than the underwater nature photography that most of the readers on Underwater Photography Guide are familiar with. 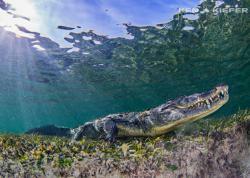 Most of us are trying to capture the wildlife in the oceans and lakes in its natural environment with natural movements. Generally, you observe the animals and determine how best to capture the angle or activity that you are hoping for. Although many of us wish it were so, water is not a natural environment for humans. The unnatural aspect creates some difficulties compared to land, but does come with a huge plus – communication. 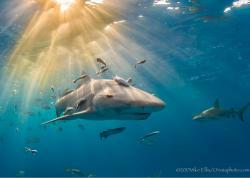 You can ask a shark or fish to please face a certain direction, or repeat a great move, but probably without much luck. Models, on the other hand, are much more amenable to direction. You don’t have to wish a face were a little more to the right, or hope for a repeated action; you can ask for it! 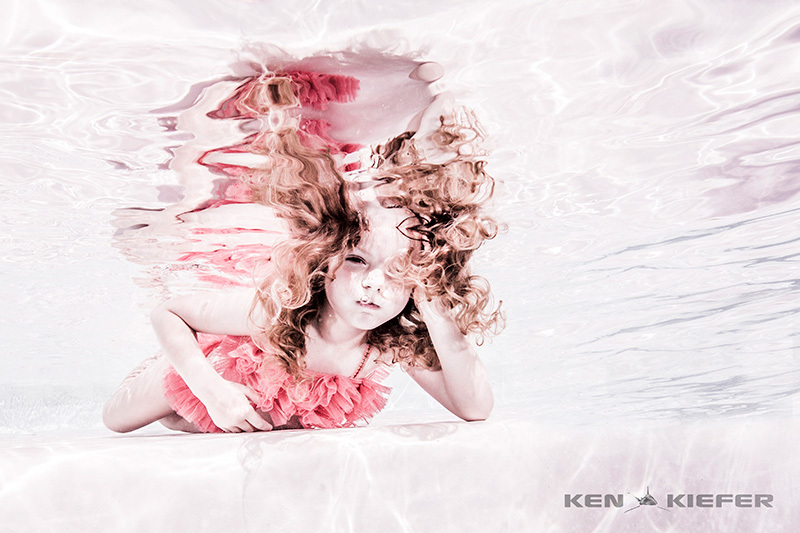 Direction and feedback is a very important component of underwater model photography. I’m very lucky in this aspect, because I’ve been able to use my wife as a model and for testing. This makes her a wonderful asset during shoots, since she knows what my goals are, what works, what doesn’t work, how to overcome difficulties in the water and can help guide and coach the models through the process. The gear for shooting models in the pool can actually be the same gear that you use for other underwater photography, or can be modified depending on your goals. For years, the only time I shot anything or anyone in a pool was to test new gear, or to practice techniques/lighting/settings/etc. before a dive trip. 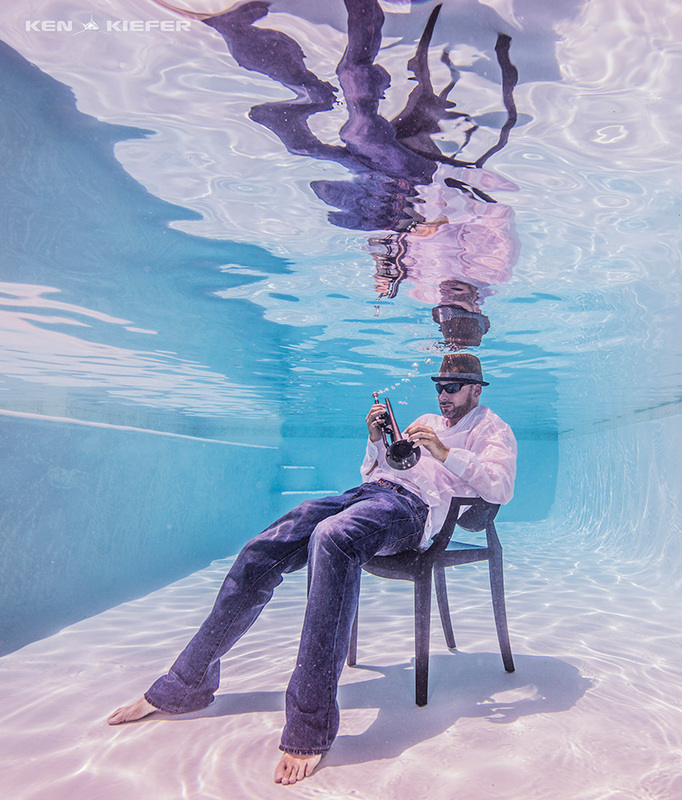 Once I started shooting in a pool frequently, my knowledge and familiarity with all of my gear increased tremendously. This is very helpful for all underwater photographers, not only for the expanded knowledge and better results; but the repetition helps you become more accustomed to the assembly and maintenance of your gear. Gear choices can be very varied, just like all photography endeavors. I don’t have enough varied experience with multiple housings/strobes/etc. to give valid reviews on the pros and cons of the choices out there; so, I’m just going to explain the reasons that I have settled on my own setup. Currently, I use either a Canon 5D Mark 3, or a 5Ds. For me, they are pretty much interchangeable. I generally don’t need the much larger file sizes of the 5Ds, and mostly use the 5D3. What I do prefer, and the reason for these cameras in my setup is the fact that they are full frame cameras. This is a personal choice based on the fact that I like to minimize the water between my model and myself and still fit as much as possible in the frame. Being closer allows you to get better isolation between the subject and the background. Plus, less water between the model and your lens will help you achieve more clarity. The lens that I use the most often lately is the Canon 16-35 f/4 IS. I’ve used the 16-35 f/2.8, both the current and the older version. I’ve used the 8-15 f/4 fisheye and the Canon 15 f/2.8 fisheye. For models, I prefer the aspherical lenses to the fisheyes to avoid the fisheye distortion to the model, props and background. The 16-35 f/4 IS has proven itself to me as having more punch and clarity with less corner blur than the other Canon 16-35 lenses. To protect my camera and lens, I use an Ikelite housing with an 8” dome port. I’ve used the smaller domes, but gain a small amount of corner sharpness with the 8”. Ikelite housings are clear, which allows you to see whether an O-ring is installed correctly or has become twisted or possibly gathered hair or dirt. Plus, it allows me to use every button/function that I have ever needed, both easily and consistently. The customer service that I have experienced from Ikelite for over 10 years has always been top notch. They stand behind their products! Lighting is a big variable with shooting models in the pool. Depending on the look that you are working towards, lighting can range from ambient sunlight to a combination of multiple strobes with lighting outside the pool. The setup that I use most of the time is a pair of Ikelite DS-161 strobes mounted to my housing with a pair of Ikelite DS-125 strobes placed off camera to be used as slaves. I like having Ikelite’s rechargeable lithium-ion batteries for quick change and long battery life. Plus, the strobes themselves have a nice warm color temp and wide beam angle both with and without the diffusers. Some of the other ‘gear’ that I like to use includes backdrops/chairs/props/mirrors/tents, and, of course, my lovely assistant. Having a model with a black background really makes them pop. I’ve done this with and without the use of backdrops, and without is much easier. If the pool you are using is big enough to allow you to use high aperture and have the strobe light only light your model, it saves the hassle of the backdrop and creates a much more complete black. Using a backdrop is unwieldy in a pool and gets in the way fairly often, but in smaller pools it might be the only way to achieve your goals. The black is not complete using this technique usually because the light is going to pick up the imperfect black of the backdrop. Experimenting with chairs and props is a really fun way to be creative. The irritation at multiple ‘fails’ is quickly overlooked when you find something really cool that does work out! Sunglasses/wigs/umbrellas can all add to images in different ways. Having an assistant is invaluable at times. Having my wife around and in the water during a shoot is one of the most valuable things I can take to a shoot. She can move fabric and hair in the direction that I want, retrieve gear, move lights, etc. much more easily than I can while holding my camera setup. 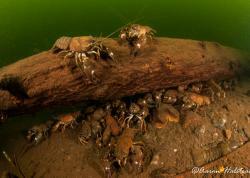 Underwater shooting is always pretty gear intensive, and everyone will develop their own preferences in every aspect. Hopefully my experiences can help a few of you down the path to your own creativity. 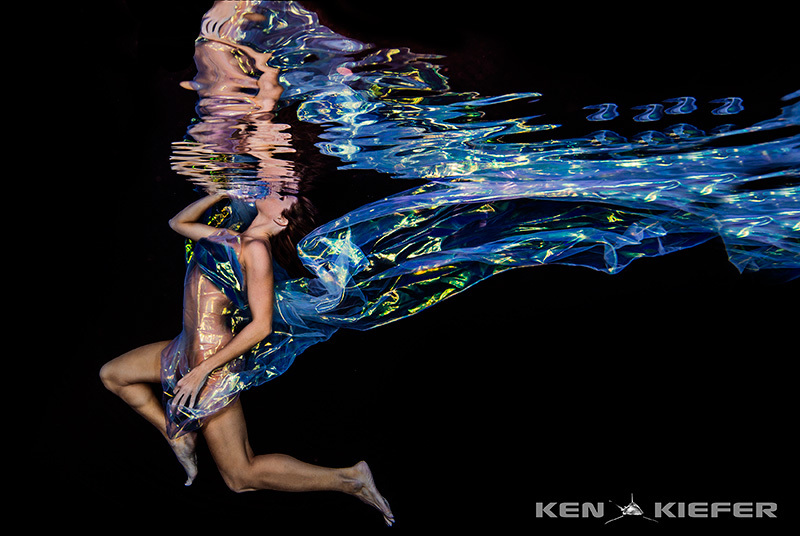 Ken Kiefer is an underwater photographer that specializes in big animals and fashion/fitness shoots. 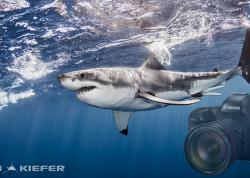 He uses his images of sharks to educate children about the realities of sharks –vs- media portrayal. View more of Ken's work at: www.kenkiefer.com.